Upon waking, your body needs nutrients. During a good night’s sleep, your body has used up a rich supply of nutrients, helping it recover from the work of the previous day. Also, it has used nutrients to heal and rejuvenate stressed or damaged body parts. If you don’t take steps to replenish those expended nutrients, the body will resort to utilizing its reserved store of nutrients. You don’t want your body to have to run your day-to-day activities on those reserves. You want those reserves for times of crisis. You want those reserves for your own protection when others around you are sick, and of course, for graceful aging. A useful analogy that we are all familiar with regarding our body depleting its reserves is osteoporosis. Calcium, an essential mineral for many bodily functions, is stolen from the bones when the body becomes too acidic. An acidic body is caused by many factors, including not eating breakfast, staying up too late, and eating processed sugar and flour. When the body doesn’t have the resources to counteract stressors, it steals from within itself to bring about homeostasis. Unfortunately, this imbalance often doesn’t show up for many years, until one actually has osteoporosis. One of the most important things you can do for your health is to think about what you are eating and how it affects the balance of your blood sugar. Without breakfast, you start the day in a state of low blood sugar. Low blood sugar is always hard on the body. It can cause premature aging and adrenal exhaustion, and it pushes people towards binge eating of high carbohydrate foods. Binge eating of carbohydrates sends a person’s blood sugar into the too-high range. The subsequent effect is equivalent to riding a roller coaster all day long. The discipline of eating breakfast helps you eat better the rest of the day. When we take eating seriously, we ingest a higher quality, and more appropriate quantity, of necessary nutrients. Eat breakfast within a half-hour of waking. Eating breakfast is a key part of the OHC plan! Your breakfast should consist of ¼ to one whole piece of fruit, followed 5-10 minutes later by non-starchy vegetables, fat, and protein. 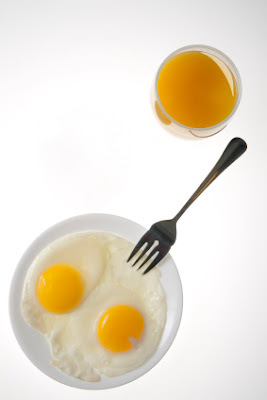 Not eating breakfast is a major factor in jeopardizing health.